Reading Chris Miller’s book about hiking the Appalachian Trail is a reminder that planning is a good thing. He had never hiked before, built a tent out of industrial plastic bags and bought new hiking boot the day he began his 1200 mile sojourn. I’m very comfortable with all the things like that for my tour. Things turned for the worse very quickly. I know my tent, how and what to pack to keep the bike from getting too heavy and stuff like that. What I am working on is the technology. It would have been very frustrating to try to work out the nuances of my gps and video equipment while working out all the other stuff during the first few days of a long bike tour. Today’s ride takes us on the Narragansett Bay Wheelmen’s ride into Mattapoisett, Rochester, Wareham and Fairhaven. All on the south coast of Massachusetts. When we pay attention to our surroundings we get to see and experience things that unless we were on a bike, we would miss. It was a beautiful sunny day for a bike ride. Trying a different form of blogging using video. I saw someone else do this and liked the idea. Tennis anyone. Played my first tennis match last night after nearly a year off. It took a while go get my first return over the net. Actually it was midway through the first set of doubles and we got smoked, 6-1. The second set my partner and I both began to hit the ball and get in good positions. We took that one 6-3. Then my partner quit. He didn’t want to overdo on his first day out. None of the four of us broke a sweat in this game which was not much different than a game of fetch. Fetch the long shots and fetch the ball from the net. Things will get better playing twice a week. On the bike side. I entered a route into my new Garmin Touring GPS and it did all the right things by alerting me to turns ahead of time and showing the route, turns, time, speed, and elevation. When it was time to post the ride into connect.garmin dot com, there was nothing saved. I’ll have to work on that between the tennis matches. The short 6 day tour in West Virginia and connecting to the Great Allegheny Passage near Pittsburgh is approaching quickly. Bike fitness is improving daily and although I am training alone this year, it’s still easy to stay motivated. This tour is sort of a shakedown for the long tour of the Southern Tier Bike Route that I plan to ride in October but may have to put off till next March. I have a fundraising commitment in Boulder in the middle of October and also need to be home by Thanksgiving. Those two things are what are making me think about moving the ride to March. While researching the Southern Tier ride I found a great series of YouTube videos by a local rider and author Chris Miller who lives 30 miles or so down Rt 195 in Pawtucket R.I. He also wrote a book titled Hiking the Appalachian Trail that looks to be a hoot to read. I did order it today. He rode this route on a cheap single speed bike he purchased at WalMart, and used paperboy baskets as panniers for part of the trip. The baskets didn’t last too long and he did eventually buy a set of good panniers. His videos grow on you the more you watch. They are short 4-6 minutes each and he says tons about how his day is going. Lake overflow gates in Mattapoisett, MA. A Biking and Football Weekend. Saturday was blustery, damp and chilly for the 10AM start to the Fairhaven Ma. Bike ride celebrating National Bike Month. I did a bit of tweaking to the route because of a late start and ended up doing 37 miles. Sunday morning was a beautiful 70 degree, calm, sunny day for the Narragansett Bay Wheelmen ride in Westport, Ma. I chose the 25 mile option and started an hour before the official starting time in order to get home before noon. This ride is considered to be one of the club’s best, rolling down the Westport waterway to scenic Horseneck Beach. I was able to get home in time to see City win the Premier League Title. I chose teams by their managers being on that side of the house for so many years. It was also a big football day locally with the Revolution thumping the league leaders Seattle Sounders, that featured the ex-Rev and Fulham FC star Clint Dempsey by a score of 5-0. This is my 7th 5 Boroughs Tour and things have improved dramatically over the years. I skipped a couple of years because of all the bottlenecks and often made my displeasure know to anyone who mentioned that ride. Two years ago they fixed things. Hearing that, three of us gave it another shot last May. They used to start all 32,000 of us at the same time, which did not work at all. My first ride, the cannon boomed to begin at 8AM and I crossed the start line at 9:50AM. Things got progressively worse annually. Now however there is a staggered start with three manageable groups of 11,000. Keep in mind how big and wide are the streets of New York. With a couple of stops along the route, my group finished the 40 mile ride just before noon. Remember it’s not a race, but a ride, and I have to say it’s a really great way to see New York. Saturday is check in at Basketball City on pier 36 in Manhattan. What a wild time that offers. It’s a huge bike expo with lots to do and people to meet. Saturday is also a good day to be a tourist in the city. Personally I stay away from Times Square, but if you have never been, it’s got to be on your list. Rockefeller Center is another spot for the first timer. We try to see a different part of the city on subsequent visits. East Village, The Bowery districe, Brooklyn, and so on. If you ever want a great way to see NYC think or riding your bike with 32,000 like minded people. This is a great weekend and is a wonderful item to add to your bucket list. The ride is so much fun and so interesting I can’t help singing it’s praises. Crossing the bridges are highlights of the ride. Here is the Wikipedia version. The tour starts at Battery Park in Lower Manhattan and ends with a festival in Fort Wadsworth, Staten Island, (the car free route continues from Fort Wadsworth to the Staten Island ferry allowing participants to make a complete 42 mile loop back to Manhattan). The tour runs north up the Avenue of the Americas, past Macy’s, before entering Central Park. After exiting the park the tour heads north through Harlem on Seventh Avenue, crossing into the Bronx for a short 2-mile (3.2 km) section before re-entering Manhattan via FDR Drive. The FDR portion of the tour runs south through Manhattan under Gracie Mansion before crossing the East River via the Queensboro Bridge into Queens. The first major rest area of the tour is at Astoria Park, Queens. From Astoria Park the tour crosses south through Queens, over the Pulaski Bridge into Brooklyn, where it follows the waterfront, past the Brooklyn Navy Yard. After crossing under the Brooklyn Bridge, the route follows up and onto the elevated Brooklyn Queens Expressway. Before 2012 it dropped onto the Shore Parkway; in that year it continued on the below-grade Gowanus Expressway and climbed over the Verrazano Narrows Bridge into Staten Island. Once in Staten Island the tour makes a stop at Fort Wadsworth for a festival, before continuing the last three miles (5 km) to St. George where most riders take the Staten Island Ferry back to Battery Park in Manhattan. Some New Jerseyans return home over the Bayonne Bridge instead. Manhattan, Queens, The Bronx, Brooklyn and Staten Island. It crosses these five bridges. Madison Ave Bridge connecting Manhattan to the Bronx. 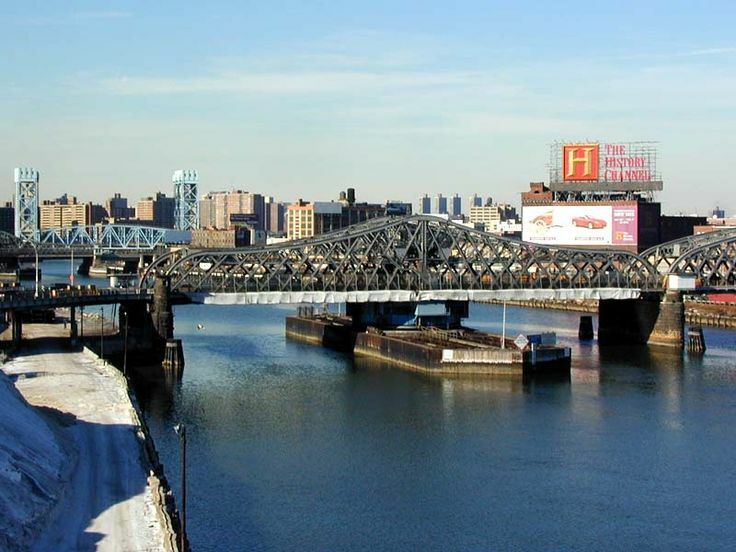 Third Ave Bridge brings us over the Harlem River again back into Manhattan. Queensborough Bridge or 59th St Bridge connects Manhattan to Queens. It was one of those days where I wanted to ride, but didn’t feel like it. You know what I mean? Providence to Bristol, R.I. is a good default route when that happens. There are lots of side trips off this path through old towns that date from the War of Independence and beyond to King Phillips War . In the town of Warren I came across a couple perusing a map. They were from the Netherlands and asked if I knew if rain was forecast because they were thinking about riding to the end of the path. I offered and they accepted a short tour of Warren that took us off the path and into town. Naturally I got us all off track and we had to ride the busy Metacom Ave to get back to the path. I complimented them both on their riding skills, being from Holland and all. I did get them back to the trail where they returned to Providence and I continued the other direction to Bristol, R.I.
On the return there were two guys repairing a flat. Courtesy dictates that passing riders ask if they have everything they need. I thought it would just be a routine “thanks, we’re fine”. “Do you have a pump”? I never saw that coming because one was an experienced roadie. The guy with the flat was wearing blue jeans with both pant legs rolled up. The roadie forgot to load a new CO2 cartridge into his kit. While we were working on the bike, an older man, maybe 50+ on roller blades stopped to chat. He lives on Long Island and was doing a 34 mile skate from downtown Providence. I don’t really know if that’s extraordinary but it seems so. Today was a really nice international day and I have believe that we don’t meet people like I did today if I wasn’t on a bike. How often do you get to do a bike ride…at midnight… in a big city… with hundreds of like minded people? Saddling up in Southborough MA. Let me say right from the get go that this is a very very cool event. Riding the Boston Marathon route at midnight with hipsters, working stiffs, grandparents, co-eds etc. spanning the gamut of shapes, sizes and abilities is a really unique and fun thing to do on a Sunday night. A few hundred of us gathered near South Station in Boston to load our bikes onto waiting trucks, each of which carried dozens of bikes. Plenty of volunteers were on hand to check in the riders and give each a wristband that matched the band number attached to their bike. Participants walked over to one of the four big trucks and handed their steed to another volunteer who loaded the bike carefully, (sort of) onto the trucks. From there it was a short walk to the commuter rail station to catch the 11PM train to Southborough. We had four rail cars filled with bikers of all shapes and sizes, excited for the 26+ mile ride back to town following the Boston Marathon route. The organization for this ride was limited to the bike transportation. Once riders got to the starting location it was completely up to them when to proceed. You see, this was an unorganized, unofficial ride. Nothing more than a bunch of like minded people who thought it would be really cool to ride the Boston Marathon route in the dead of the night. While on the train we could see bikes already making their way back to Boston and we were still 30 minutes from the starting point. At South Station people were randomly approaching others to talk about the ride and whatever other subject was broached. I took a long table, and as I began taking notes a couple of young riders joined me. Both saying the bike helmet acted as an invitation of friendship. Talking with Casey and Brian, both on their first Midnight Marathon and both working and bike commuting, I commented that it seemed like I was the only rider over thirty participating in this event. Before I added the period to my sentence, Jim a fifty something sailor, and Steve Miller of Livable Streets organization joined us and completely put the age theory to rest. The station quickly filled with helmet carrying cold weather clad bikers and one could begin to feel the vibe of the upcoming ride. There was a mix of veterans and first timers and the group took on the look and feel of a very hip crowd. After all, what group of people is more hip and as cool as bikers? In case your stumbling on the answer it’s none. Brian and Casey joined me at the table to wait for the train and talk bikes and life. Both are university grads in Boston. With over 70 colleges in town and it seemed everyone I asked had a different Alma mater. Hanging around waiting for the train. During this ride I came across a guy who’s right pedal fell off. When I tried to help out I saw that the threads were stripped and the pedal was being secured by wrapping electrical tape to substitute as threading. A mother and daughter, obviously novice riders were not getting along very well at all. One woman spotted a cab at around the 17 mile mark, dismounted and frantically began waiving down the driver. I didn’t look back to see if she was successful, but did feel bad that she felt the need to bail out. She was obviously riding alone and my guess is that the mind games of “I can’t do this” got the best of her. On the positive side, I saw a group taking a photo at the top of Heartbreak Hill. Little did they know that it was only the teaser part and they still had more than a mile to crest this demoralizer of marathon runners. One of the most unique participants was a 20 something guy on a skateboard. He got my kudos. There were also lots of fixies and single speed bikes. Those are the hipsters I spoke of . Catching up to a group I noticed the attire of one of the riders. She reminded me of riding in Copenhagen where many of the women bike to work in very nice and classy outfits, and the jackets are quite stylish and unique to Europeans. As I approached I told her that she looked very hip and reminded me of Denmark. The young man riding the bike looked over to me and said “really, thanks”. Later on I was passing a rider struggling up a modest hill. “Is this your first time” I asked. He replied in the affirmative and said over and over that his wife did this event last year, loved it and talked him into doing it on his undersized department store bike. I asked why she didn’t ride this year and he said she did. She is way ahead and is a much better rider, “I’m not very good” was his comeback. I told him there is really no such thing as good or bad riders and that it was his bike holding him back not his riding ability. He was doing fine but just did not have the gearing and fit to make this a much more enjoyable night for him. He did say that he enjoyed this so much and was thinking of upgrading his bike and ride more often with his wife. When we finally got into the city there were only a handful of us on Beacon St. Three of us began questioning the route because there was no one else around, and that was unusual. Shortly a trio of riders approached and when we asked they said this is the route. Just follow the Green Line. Since there were tracks in the middle of the street I assumed they referred to the public transit Green Line. It was suggested to me by a couple of riders to purchase advanced tickets to the after ride pancake breakfast on Washington St. at Downtown Crossing. I did, reluctantly, online. After waiting outside in line with cold feet because of the 35 degree weather for 25 minutes without moving even a foot toward the entrance, I decided to take the $11 hit and ride back to my car and home. We weren’t waiting for the light but just hanging around chatting. This is Boston where red lights are a mere suggestion. The front rider enjoyed this event so much he will be upgrading to a much better bike and begin riding more events with his wife. Did the whole thing on a skateboard. I did see him being pulled up a hill by a bike riding friend. Maybe this is what he meant when he said follow the green line. Downtown Boston at 3AM and it started to get busy. The Marathon was to begin in a few hours. East Providence to Briston R.I.
“Is that a video camera on your head”. “No, it’s a light. We are getting ready for the Midnight Marathon on Sunday. We are also training for the Five Boroughs ride in NYC in two weeks”. “Really? Me to”. That’s where 32,000 of us will grab life by the handlebars and ride the five boroughs and cross five bridges of New York City. How could I not induct these two into the realm of A Midnight Rider, when it’s obvious to even the most casual observer how these two fit into the riding brother/sister- hood. Till this morning it was a brotherhood but I have been enlightened. Most people I tell about the rides warn of the dangers of riding in Boston… at night….on the marathon route no less. And the mention of NYC to many bring out their fear of getting blown up or accosted by Yankee fans. When I hear this I always ask one question. The two new “riders” also talked me into buying a breakfast of 2 pancakes and a slice of bacon for eleven bucks. We’ll see how that works out. I’ll bet it will be worth it. I wanted to get more photos of the cafe tour riders but again we all started yacking away at the Bristol Bagel Works and I forgot all about taking out my camera. First attempt was photo bombed by a Cafe Tour Rider. Figures he is from Fairhaven.